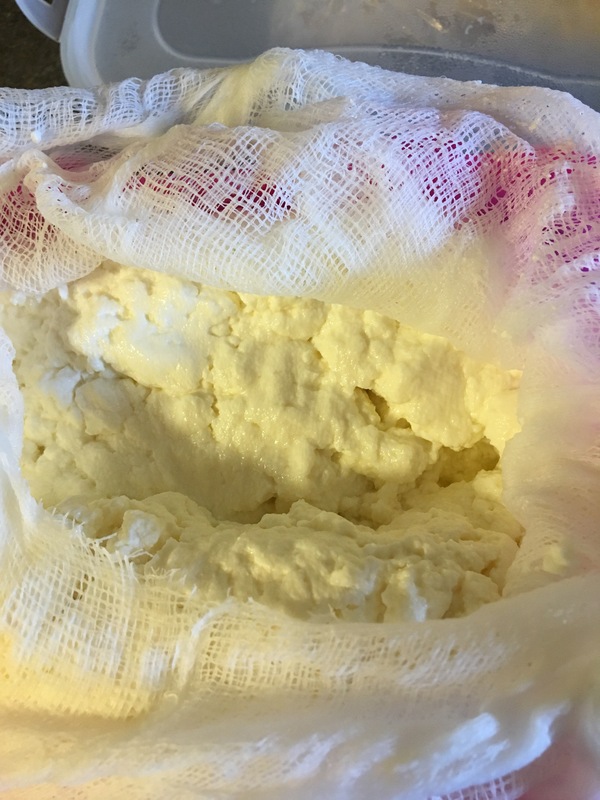 This easy homemade cheese is wonderful any time of day. For a sumptuous start to your day, serve it with honey and kosher salt on grilled crusty bread; for a simple snack, drizzle olive oil over a large dollop of ricotta, sprinkle with crushed red pepper flakes and kosher salt and serve with crusty bread and for dessert, serve with grilled peaches sprinkled with fresh thyme and drizzle with honey. In a large pot, bring cream, milk and salt to 190 degrees… Bubbles will just start forming at the edges. Stir in lemon juice or vinegar turn heat to low and allow curds to form. Stir gently. Cook for 10 minutes. Remove from heat. Place a large colander in a large bowl; double line with cheese cloth. Spoon cheese into cheese cloth, allow to drain. You can eat it warm (we can’t help ourselves! ), or keep for other uses. Keep sealed in fridge for up to 5 days. Note: before squeezing excess liquid, you can season your ricotta with more kosher salt and chopped oregano and crushed pepper. Weigh down as mentioned, and to serve, slice into squares drizzled with olive oil – serve with smoked salmon and crackers.